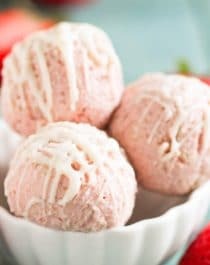 These Gluten Free Strawberry Shortcake Cheesecake Truffles are made with real strawberry cheesecake and sugar cookies chunks, and are coated in rich and delicious white chocolate. If you’re looking for a guilt-free bite-sized treat, you’ve found it! What do you do with a cheesecake that doesn’t turn out as planned? Whether the surfaces cracked or you accidentally overbaked it, there’s always a solution: make truffles with it! My original plan for this recipe was to make a Strawberry Cheesecake — both a guaranteed crowdpleaser as well as a sweet pink treat to bring more awareness to October being Breast Cancer Awareness Month (the month of pink)! While the cheesecake was so incredibly fragrant coming out of the oven — my entire apartment smelled like strawberry jam — the overall color wasn’t as pink as I’d hoped. On top of that, the surface had cracked. After the cheesecake cooled, I wrapped it and stuck it in the fridge to chill overnight while I brainstormed a way to mask the ugly appearance. Things got worse. By the next morning, the already barely-pink-color faded to a greyish-pink! I sliced myself a little wedge and took a bite… IT WAS DAMN DELICIOUS. This could not go to waste. This creation needed to be shared with the masses. But how? So, with my ugly (yet delicious) Strawberry Cheesecake, I made these Gluten Free Strawberry Shortcake Cheesecake Truffles. It seriously tastes like Strawberry Shortcake because of the chunks of real sugar cookies and intense strawberry flavor. Best of all, this recipe is super easy to make! It may seem strange to literally dump an entire cheesecake into a stand mixer and beat it all together, but trust me on this. 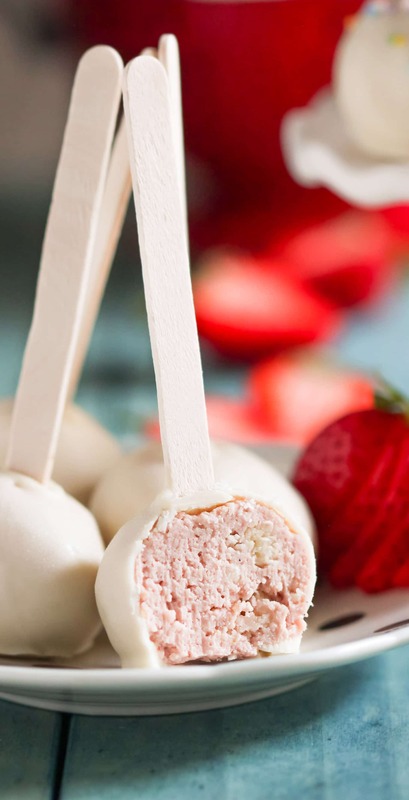 Y’all can’t miss out on these Gluten Free Strawberry Shortcake Cheesecake Truffles. These Gluten Free Strawberry Shortcake Cheesecake Truffles are made with real strawberry cheesecake and sugar cookies chunks, and are coated in rich and delicious white chocolate. If you're looking for a guilt-free bite-sized treat, you've found it! In a large bowl, stir together all of the crust ingredients until it comes together like a dough. Press the mixture into an ungreased 9" springform pan. Bake for ~23 minutes, or until it's puffy and just starting to turn golden brown. Let cool while you make the cheesecake. Reduce oven temperature to 325 degrees Fahrenheit. In a stand mixer bowl with whisk attachment, add the cream cheese, Greek yogurt, and strawberry puree. Mix on medium speed until completely smooth. Add the eggs one at a time. When completely mixed in, add the vanilla paste, stevia extract, and lemon zest. Scrape down the sides of the bowl and mix again until completely smooth. Pour batter over the sugar cookie crust and bake for ~1 hour, or until the edges are set and the center is just a tiny bit jiggly. Let cool completely, then cover and refrigerate overnight. In a stand mixer bowl with beater attachment, dump in the cheesecake. Mix on low speed until completely smooth. Add the freeze-dried strawberry powder and mix until the color is even and pink. Scrape down the sides of the bowl and mix again. Line 2 cookie sheets with parchment paper and reserve space in your freezer for the trays. Use a cookie scoop to portion the mixture onto the cookie sheets. Freeze uncovered for 1 hour, then roll the scoops into balls. In a double boiler, melt the white chocolate and coconut oil. For a chocolate drizzle: Drizzling the white chocolate over the truffles and place in the fridge to firm. For a chocolate coating: Dip the ends of popsicle sticks or cake ball sticks into white and then immediately into the truffles (this keeps the stick from falling out). Dip the truffles into the melted chocolate one at a time. Shake off the excess chocolate, place back on the pan, then place in the fridge to firm. Serve and enjoy! Store in a sealed container in the fridge for up to 1 week. **Amount of white chocolate and coconut oil will depend on if you're just drizzling the truffles with white chocolate or dipping them completely. Or you can omit this completely, these are great either way! I drizzled half of the truffles and coated the other half. I froze some of the chocolate-dipped truffles and OH MY GOODNESS, they're amazing straight from the freezer. They're like Cheesecake Ice Cream Pops. Just an FYI, because y'all need to try it! These truffles are the perfect thing to bring more awareness to Breast Cancer Awareness Month. And to make things a little easier on us all in the kitchen (especially with the upcoming holidays), I used Immaculate Baking’s Gluten-Free Sugar Cookie Mix instead of making cookies from scratch. Super sweet, decadent Gluten Free Strawberry Shortcake Cheesecake Truffles? Bursting with strawberry flavor and coated in delicious white chocolate? These sound amazing & look so pretty in pink! Gotta go check out the cheesecake ones now! 14 cake pops? I’m in!! This looks great! Very cute and I love the pics where the cake pop is standing inside the strawberry. Thanks for sharing! Will the chocolate coat melt when placed in room temperature for quite some time? ANYWAYS, those days are long gone (thank god). Drooool. The more ways I can eat cheesecake, the better. These little treats are the perfect poppable fix for my sweet tooth!